This was an extremely cold morning for early October, which is unfortunately something that I know all too acutely. Callie and I had driven up the previous evening and didn’t arrive until shortly after midnight. Thanks to the government shutdown, we were just sleeping in our car at the trailhead since nearby campgrounds were closed. This is not something that I am used to, or experienced at, which would become quite clear. Somewhere in the mix of setting things up for the night, the car doors got locked. I didn’t think much of it at the time. A couple hours later in the middle of the night, nature called and I crawled out of my sleeping bag and opened up a car door. Suddenly, my car alarm went off, and I was standing out in the cold dark air in just my underwear and a t-shirt with no idea where my car keys were in the giant pile of stuff in my car. Whoops. There were about 6 other cars parked in the lot, and I immediately felt like a total jackass for possibly waking up other people at 3AM, but fortunately I was the only person to witness this unfortunate moment. It ended up taking me about 5 minutes to find the keys, and in that short period of time my body temperature dropped significantly. If you ever want to get a feel for how cold an environment is, I highly recommend this technique. I quickly got back into my 15 degree bag, threw a blanket on top, and slowly warmed back up and tried to salvage a few hours of sleep before getting up for our pre-sunrise hike. A few hours later, the alarm went off and I was back out in the cold dark air, but with clothing on at least. I had expected it to be cold, but this was a whole different level from typical fall weather in the Sierra. The locking mechanism on the car carrier on the top of our car had frozen, and my keys got jammed into the lock when I tried to open it. It took me a few minutes before I was able to wrangle them loose with my numb hands. All of our food was in there, so we had to set off on this hike without any breakfast or food for the hike. Not a very solid start for our fall color trip. Later that day, I spoke with a backpacker who had been camping on the west side of Mcgee Pass, and he commented that in the morning when he filled his water bottle, it froze solid within a minute. Needless to say, we stayed in a hotel for the next two nights. Hitting the trail, our spirits were pretty high though. Considering the sleep deprivation and 10 degree temperature, I’d say they were about as high as possible in fact. After about a third of a mile, we set up in front of a prominent aspen grove that was approaching peak and waited for the color show. It wasn’t a moment too soon, by the time I was set up the alpenglow was already beginning to light up the top of Mount Baldwin. As the trail goes up the canyon, the groves along Mcgee Creek and on the ridge below Mount Baldwin create a beautiful stripe that winds up the mountain, and we were fortunate to hit this area close to its peak fall color. 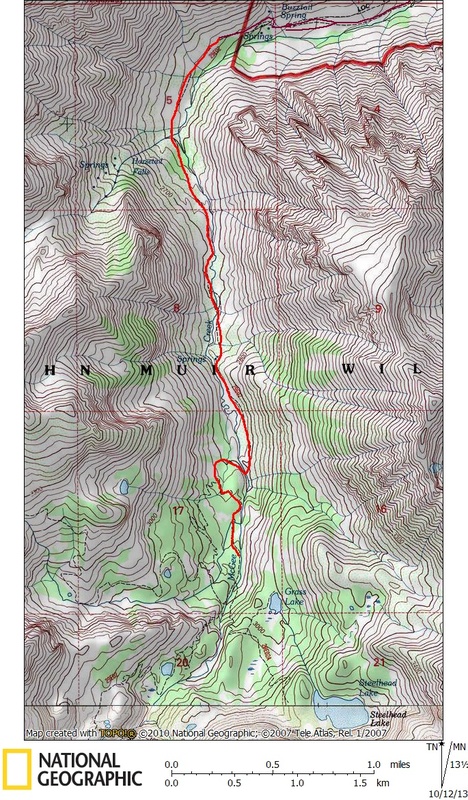 The trail through the lower part of Mcgee Canyon is about as flat as you’ll find in the Sierra. The wide level trail is perfect for travelers of all kinds, especially dogs that are not able to tackle more substantial trails. For that reason, this was the first trail that Callie hiked in the Sierra, back in 2011 when she was just 5 months old. Two years later, Callie is already a seasoned traildog, but her enthusiasm for the trail remains undiminished. Beyond the trail, the area is ripe for exploration as well. Some of the best views in the fall are along Mcgee Creek, but access is rarely as simple as following a carved out path. In most cases, some degree of bushwhacking is required to take advantage of the variety of views potentially found along the creek. This can range from quite enjoyable to mildly uncomfortable, depending on your ambitions. Back on the trail, the canyon begins to steer to the south away from Mount Baldwin and Mount Aggie, opening up new views in the process. What splendid views they are. I hadn’t seen many photographs of this area during fall, because most photographers prefer to stick to the lower area of the canyon; their loss. Here, Mcgee Creek widens into pond, which was still partially frozen from the unusually cold evening. The morning light on the aspens reflected off the parts of the still lake surface that had melted off. What made the moment all the more special was the fact that we had the place to ourselves. The complete stillness and silence in a setting like this provides me profound peace, and it reminds me why I sometimes eschew photographing classic scenes like North Lake during sunrise, where you are guaranteed to be surrounded by photographers more focused on their viewfinders than the majesty of what is in front of them. A little further up the hill, the trail goes over Mcgee Creek with a tricky log crossing. I’m usually pretty confident with these types of crossings, but this one was quite slick so I ended up crossing the river downstream and getting my feet wet in the process. If you are just hiking for fall color, then there isn’t much need to cross the river. The trail begins to ascend more rapidly through a dense forest with only a smattering of color to be found. This trail accesses a number of lakes on the east side of the pass, as well as a whole region of dog friendly backcountry over the west side of Mcgee Pass. For this trip, we were focused on fall color so we began to head back down the trail before reaching any of the lakes. The views going back down aren’t quite as spectacular without Mount Baldwin and Aggie dominating the backdrop, but one nice thing about hiking in the fall is that the leaves take different appearances as the day progresses and the light changes. By the time we reached the areas where the color was peaking on our way back, the sun was high in the sky providing some intense back lighting on the trees. This type of lighting can cause the foliage to glow brilliantly. Upon arriving back at the car, the weather had warmed up about 40 degrees and we could access our food again. Success! Sitting among the aspens with a grilled cheese and beer, the morning’s trials felt like a distant memory and life was just about perfect. It’s amazing what a few hours in the Sierra can do to your psyche. Thanks! I think that by this weekend most of the color in the Eastern Sierra will be gone. It seems like everything peaked a little early this year. Fabulous set! I was just up at Bishop Creek, June Lake and Convict Lake this past Saturday and the colors are really in full swing. Love the Sierra Nevada! Loved the pictures and report writing. I haven’t been to McGee Canyon but have it on my radar now after seeing these pictures. Glad it worked out well with the early drama. I particularly loved pics 1,9,10,15 & 17 after the map. Wondering if you use a tripod? Yes, I do often use a tripod. Mainly around sunrise and sunset when there is not a lot of natural light yet.